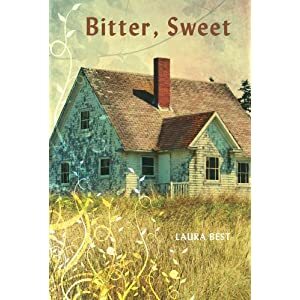 I chose this title thinking of a writer from Ontario whose work appeared in some of the same publications as mine over the years. She was a retired schoolteacher when we became acquainted. She often sent out emails to the people on her contact list with the title “Catch up” and she’d tell us all the news from her corner of the world. She once sent me a photo of the farmhouse she lived in. It was beautiful. Over the years she moved several times as she downsized. She sent me some of her books in the past and shared her poetry with me, although she wrote more fiction that poetry. She’d tell me about the trips she went on, which sounded so remarkable to me for she was over 8o at the time. I was impressed by her stamina and her ability to try new things, her sense of fun and spirit. I came to value our friendship. Overtime the emails became less frequent and I couldn’t help but notice that she seemed a bit confused–sending the same thing several times. Eventually, the emails and letters stopped. I have no idea if she’s still with us in mind or body, but I appreciated her encouragement over the years and all her little “catch up” emails. So, here is the “catch up” at the Best household this time around. Hold fast to your britches this is exciting stuff! Zucchini…zucchini…zucchini. 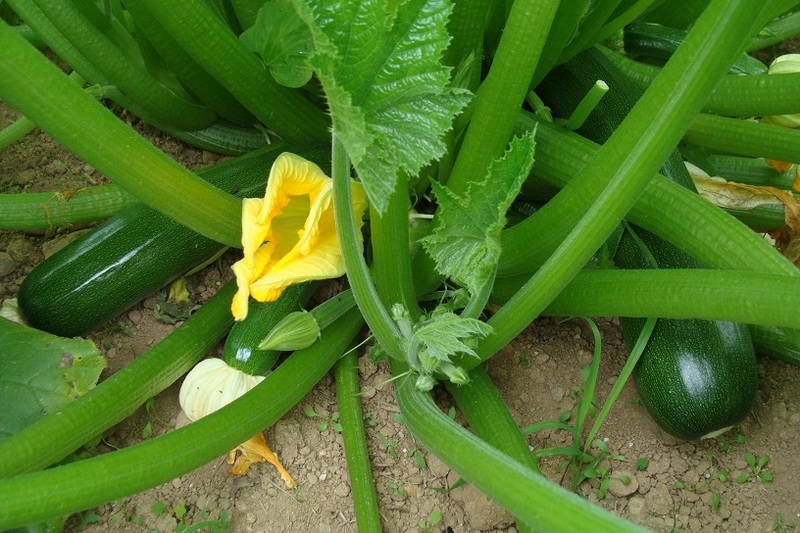 But if you’re on my Facebook you already know that it’s a zucchini jungle here in East Dalhousie as an influx of the green beasts are arriving daily to my garden. I’ve been slowly finding homes for these wayward …Ummm…souls doesn’t sound appropriate here, but you know what I mean. Here’s the scoop when it comes to zucchini. You either love them or loathe them, and when you loathe them you REALLY loathe them to the point where you don’t even want to hear the word zucchini mentioned in your presence. I have shuddered in the past over people’s rendition of the “I hate zucchini and don’t even mention the word to me” ballad. These people need some serious help! On a positive note, I’ve been discovering some new recipes that incorporate zucchini. 5 weeks to T-Day (That’s twin day for those of you out of the loop) although I won’t be surprised if they come a little ahead of schedule as they’re growing like zucchini …um make that weeds. Did I mention we’re having a girl and a boy? Exciting times. Speaking of twins, it seems there are twins everywhere I look. 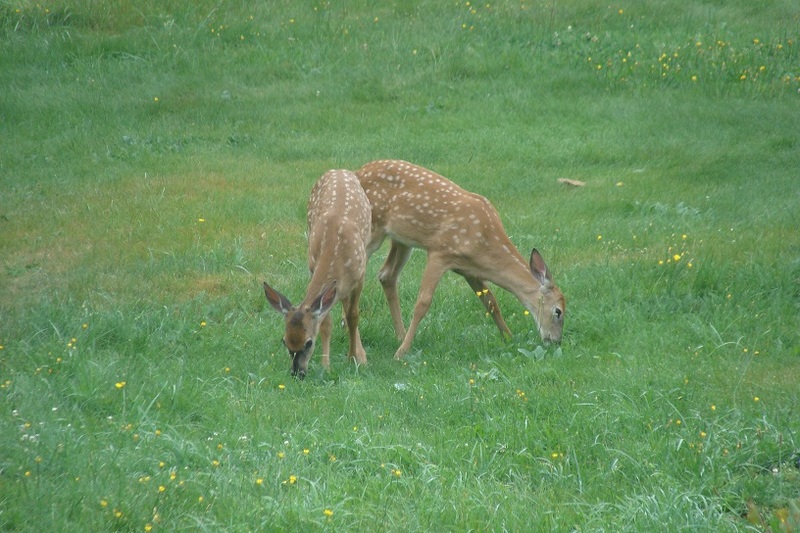 These twins were in the backyard yesterday nibbling away. No doubt a hint that the lawn could use mowing again. Miss Charlotte has her backpack ready and will heading off to school on the 8th of September. I can’t believe how quickly the time has gone. Wasn’t it just a year ago she started walking and talking and reading? Oh my! Some sad news for us this month as well. One of my mum’s childhood friends, who went to the School for the Blind with her, isn’t doing so well. My mum and stepfather got down to visit her in the hospital yesterday to say their goodbyes. The last time I saw her was at Mum’s wedding last fall. She was anxious to know when my next book was coming out. Growing up, I heard so many stories about Mum’s friends from the school and many of them have stayed in contact with her over the years. It’s a strong bond they all share. That’s what friends are for—I’m reminded of this in so many ways. A late night email from a friend, who sent along some words of encouragement, for no particular reason, not only gave me a much needed boost, but impressed upon me the importance in lifting one another up. We can all use encouragement, not just during our low times, but all those times in between—writers especially. So a big thank you to my friend who understands that the little things really do mean so much. 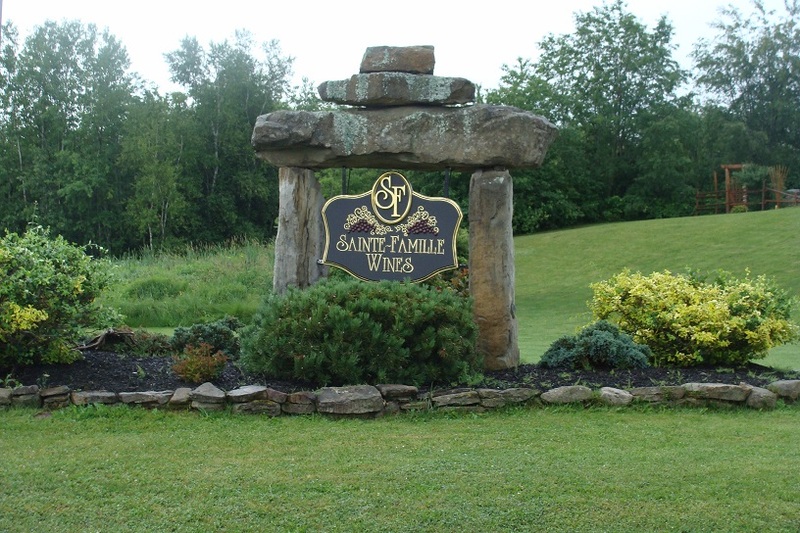 We were to a beautiful wedding at the end of July at Sainte- Famille Wines in Falmouth. So happy for these friends who go back all the way to elementary school if we’re being technical. I’ve a few book events coming up in September and will be part of the Arts and Life Tour again this year. I’ll be at the Parkdale/Maplewood Museum the same as last year. You’ll even see my name listed! Drop in and say hello if you’re taking in this tour. I’ll be there with my books and we can talk about writing or zucchini—you choose. I’m versatile that way! Seriously, sometimes people shy away from speaking to authors at these events, feeling that they’ll be expected to buy a book. That’s not true. While authors love it when someone makes a purchase, we also love meeting people and having a good gab! Now it’s your turn. What do you have to share as part of this “catch up” post? 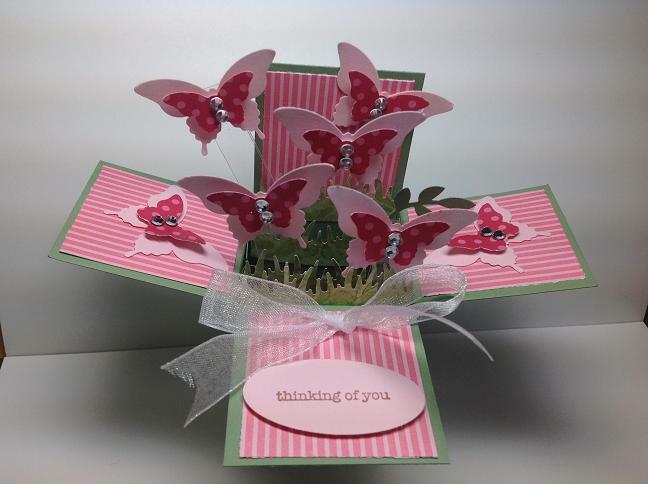 “Just living is not enough,” said the butterfly, “One must have sunshine, freedom, and a little flower.” Hans Christian Anderson I just wanted to share these butterflies on my blog today. A lovely card from a lovely, talented friend who always seems to know the exact words I need to hear. Enjoy your weekend! And Happy Father’s Day to all the dads out there. 8.Good food & good conversation. Add ingredients one at a time, place inside the most gorgeous Nova Scotia day you can find. Stir. The coffee at the Tim Horton’s might not have been the best (for the love of all that is holy with coffee, get the order right. One black, two cream, no sugar, One cream with sweetener… Gah!) but the rest of the day turned out to be great fun.The ladies in the photo have been friends for many years, but the three of them had not spent time together since the seventies. Talk about a giddy bunch. I suppose that’s to be expected. Once you make it past 50 it takes less and less to amuse you. Having turned 50 last year, my friends can vouch for the fact that I’ll laugh about pretty much anything. But there are worse things, I’ve been told. 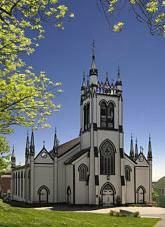 After a quick cup of coffee we went off to St. John’s Anglican Church in Lunenburg. It’s hard to believe that this church survived a fire ten years ago. Luckily, there was enough of the building remaining and the determination to rebuild this beautiful centuries old church and bring it back to life. A lot of hard work went into restoring this fine building that was originally built in the mid 1700’s. To attend a service is to truly experience this church to the fullest. I felt as though I was in the midst of a fairy tale as I gazed at my surroundings. After the service which lasted nearly two hours, I might add, we headed off toward Mahone Bay for lunch. 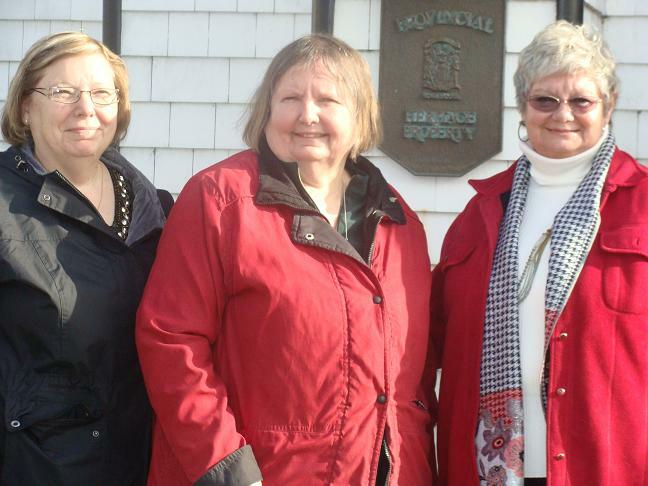 Driving through the town of Mahone Bay is always an experience in itself. Seems as though there is always some festival going on—great for the tourists, you know. Remember back in October when I wrote a post about the Scarecrows and posted a few photos? If you’ve already forgotten you can check out the post here. Not to disappoint, Sunday was the Father Christmas Festival. Yup, good old St. Nicholas was everywhere. I have a few photos that I took as we passed through that I’ll publish in a later post. I only wish I had been able to get a few more shots in, but lunch was awaiting us, and well…Lunch was awaiting. Have you ever had the feeling that you draw attention where ever you go? 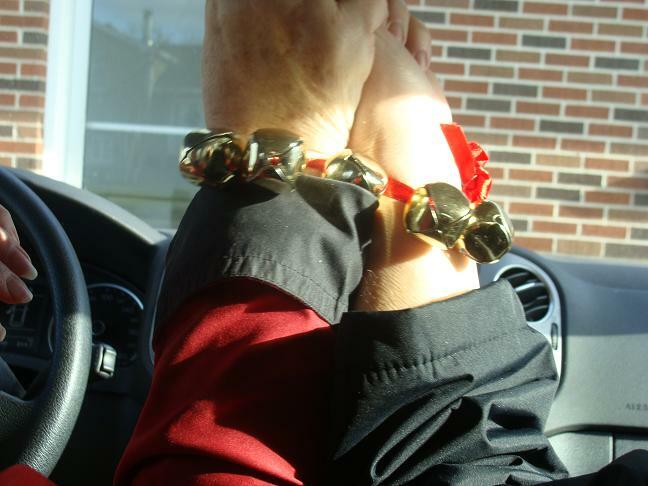 I just have to say that if four woman with jingle bells tied fast to their wrist with red ribbon..well…can you imagine? Mind you this isn’t something that I would normally do on my own, but…what can I say? I’m a follower, not a leader. Nor did I want to be left standing by a a pile of rocks overlooking the bay. I just wanted to fit in gall dang it all! Which I think I did pretty well. Besides, they struck me as a bunch who wouldn’t hesitate to leave me stranded by the roadside with nothing but the sounds of jingle bells and laughter in their wake. Too late then to remember I’d forgotten the cell phone. 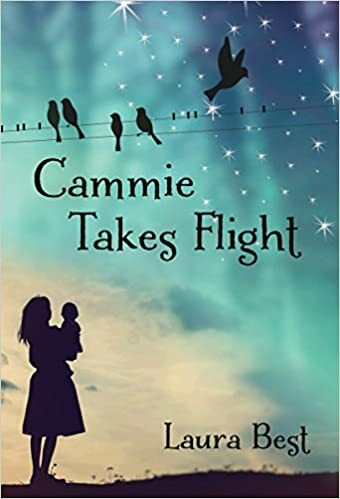 Before the day was out I had convinced Doe to take a signed copy of my book home with her to Ontario, making her vow that she would promote this book like it was her very own. (Enough begging and pleading and even the toughest nut will crack.) She finally gave in when I promised to throw in a bookmark. I felt fortunate not to have had to resort to arm twisting, nor was throwing a temper tantrum necessary.. She’s such a good sport. A real dear (or is that deer?) Sorry Doe, I could not resist. All jokes aside. Thank you Gail, Carol and Doe for a truly memorable day. Here’s to friendships, old and new. And here’s to creating your own recipe for fun. What are some special ingredients that you would add to your recipe for fun? I once thought that all trilliums were white with pink stripes. After all, those were the only ones I’d ever seen. 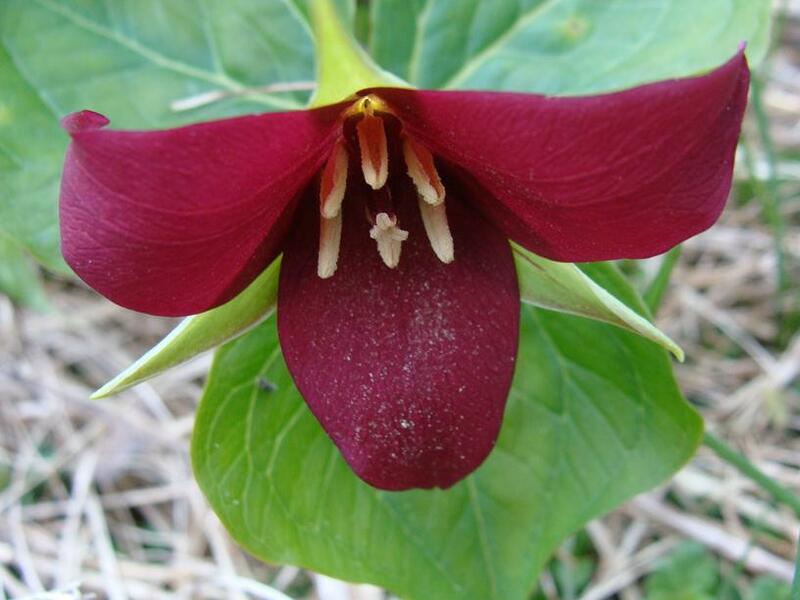 It wasn’t until I was thirty that I discovered that there were also red trilliums growing in the forests of Nova Scotia. Who knew? Twenty years ago a friend and I dug some out, and brought them home. Each year they come up, and they always remind me, not only of my friend, but the fact that there are so many things in the world I have yet to discover. I love the fact that, for each of us, the world is filled with many new, and undiscovered places and things. How can we possibly know everything that is out there for us to know? The earth is huge and we are one, important only to our own little corner, but so small in the grand scheme of things. After a time our eyes become adjusted to life around us, sights sometimes become stale, recognizable, and often predictable. You know– the same old, same old. I’ve never been away from home for extended periods. A week is actually the longest. But each time I’ve walked into my house, after being away, it felt as though I were seeing it with fresh eyes. Isn’t that the same kitchen counter I left behind? And aren’t those the very same curtains? Yes, but somehow they look and feel different. The world inside my house looks brighter than it did when I left, and yet, nothing has really changed only my perception. Even though that “new to me” feeling will last only until my brain becomes adjusted to my surroundings, it is an almost magical feeling for that first little while. We get the same feeling when we rearrange a room or add a new coat of paint. One of the jobs a writer has is to take something familiar and make it feel fresh, open the reader’s eyes up to that seeing-it-for-the-first-time feeling. Perhaps it is something new and undiscovered to them, although you can bet, that for every reader out there, that new and undiscovered story is something they are familiar with. Every writer has their own secret weapon-— no one else sees the world the way we do. No one else can bring life to that blank page– the thoughts, memories, or impressions that make up who we are—the way we, as unique, individuals can. My friend knew about red trilliums and I didn’t. Although they are not as abundant as the white, they are out there if one knows where to look. For me, they were something new and wonderful. Even now twenty years later, when they open up each spring, I feel as though I’m looking at them for the very first time. It is a wonderful feeling. The trilliums are not just flowers for me, they are time and place and friendship all wrapped up in one. Do you have any newly discovered things or places that you’d like to share? To anyone else we might have looked like two old friends drinking coffee and catching up on the latest gossip. Our conversation was intense. We settled right into the purpose of our meeting, to talk about writing and publishing, and everything in between. We swapped stories, shared a few laughs, spoke of our personal triumphant and the many disappointments we’ve encountered along the way. The time flew by. We parted, promising we’d get together again. 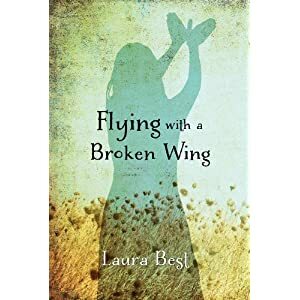 I often imagine that I’d soon bore my non-writing friends to tears if I spent too much time talking about publishing and writing, and for good reason. For many of them they love the fact that I’ve been published, in fact they couldn’t be more supportive, but to them it’s a whole other world and a strange one at that. It’s probably difficult for those who don’t write to understand why writers put themselves through the long torturous wait times, the countless hours spent in solitude working at their craft, and the numerous rejections that come along the way. In what other area of our lives would be take such a beating, such outright rejection, and keep on going? If I went off to work each day to be told repeatedly by my boss that I wasn’t doing my job quite right, or that I was actually doing everything right but it wasn’t going to make an ounce of difference at the end of the day, I would probably go off in search of another job. And yet we writers swallow it all and keep on going, the serious ones that is. Our need to be published, to feel some validation for our work, is a strong one. And it needs to be strong or else we’d fall at the wayside and turn our backs on our dreams. Not everyone who writes is seeking publication. Some people write for their own enjoyment and have no desire to have others read their words and this in no way demeans what they do. But for the rest of us hopefuls we wait and wait for those glorious letters of acceptance that sends our spirits soaring to the cosmos. Someone thinks our work is worthy of publication. Oh happy day! Yesterday I spent the afternoon deep in conversation with a fellow author. It was great to share stories with someone who is taking the same journey. Were it not for the fact that we are both writers, I’m sure our paths might never have crossed. Our backgrounds are totally different in almost every way imaginable, our writing styles just as different. I walked away with the knowing that it’s not necessary to have many things in common with someone to enjoy their company, and bonds can be formed between those who share the same passion no matter what that passion might be. Most of my friendships have been formed through the years with people who do not share my passion for writing. Many of my friends are not even avid readers, and I’m totally fine with that. These friendships are equally important to me. Yes I am a writer but I am so much more. As we go though life we encounter many different people all with a wide variety of interests. Thankfully, we are multidimensional beings and we all help make the world an interesting place to be. We all bring to the planet our individual gifts that originate from the place where creativity and passion are born. Today is a day for reflection as I take time to be thankful for the many different friendships in my life—- old and new, “real life” and online. You know who you are!